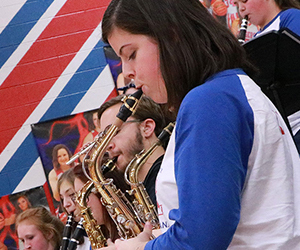 At NDHS, we believe that the fine and performing arts are important parts of the curriculum. Even if our students don’t go on to become professional artists, musicians, or actors, we’re confident that their exposure to the arts under our care opens their minds to the beauty our world has to offer—something that will stay with them for a lifetime. Our Music Department encompasses both our instrumental and choral programs. We’ve recently adopted a new communication tool called Charms. This all-inclusive program allows us to communicate more effectively by sending emails, posting reminders, and keeping an up-to-date calendar that lists of all our practices, rehearsals, and performances in one place. You can even access your trip account balance and make trip payments entirely online! Simply click on the Charms button and enter our school code, “northdecaturmusic” at the prompt. Our choirs, directed by Dana Chandler, showcase the great talent at North Decatur. During choir, students refine their technical singing ability, improve sight reading, and learn appropriate performance etiquette.